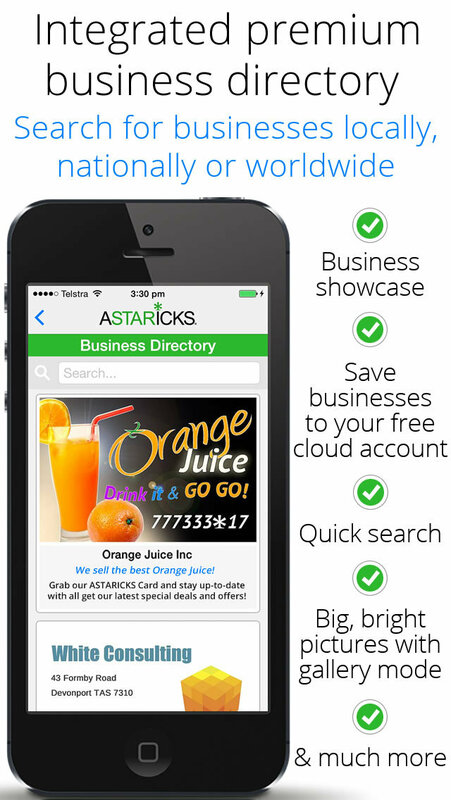 ASTARICKS® is the world’s premier digital business card system. Save, sort, view & share ASTARICKS Business Cards superfast - online, over the phone, face-to-face and at expos, conferences and seminars. There’s no need to take a photo or scan a card. No OCR problems and 100% Accuracy. ASTARICKS CARDS are interactive, updatable and secure and can contain up to 10 HD pictures. • ASTARICKS Cards are interactive, updatable and secure! • No need to type any business details, they’re already in the Card! • Save and share Cards - online, over the phone, face-to-face and at expos, conferences and seminars. • Link to business website, online shop, Facebook®, Twitter®, LinkedIn® etc. • Receive push updates if any business details change, eg: address, phone number, picture etc. • Share Cards via the ASTARICKS CODE system or email, SMS and QR Code. 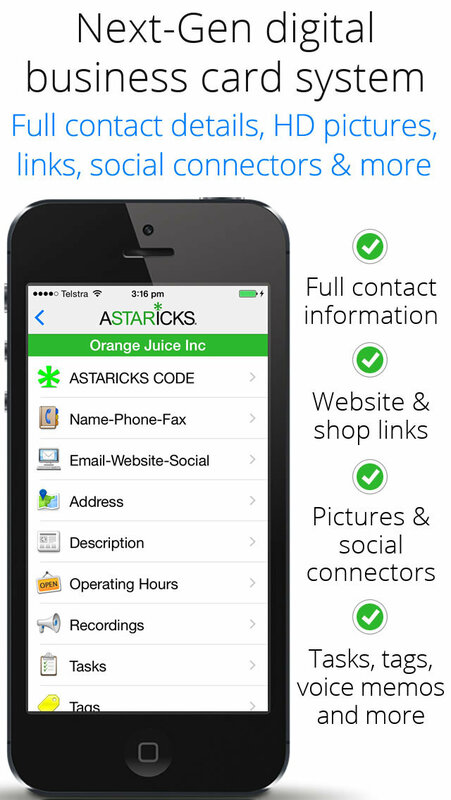 ASTARICKS Cards are a revolutionary new interactive, updatable and secure digital business card that contains detailed business contact information, business description, operating hours, pictures, logos, web links, social connectors, maps, directions & more. ASTARICKS CARDS contain a lot more information than a regular business card & they’re updatable which means if an ASTARICKS Card is updated with new information such as a phone number or picture, everyone who has that particular ASTARICKS Card will receive the update, this means no out-of-date information! 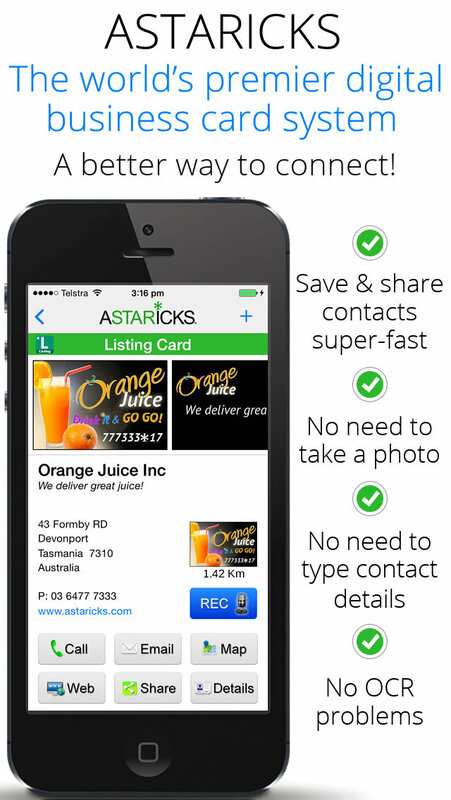 ASTARICKS Cards provide many advantages over current business card systems. ASTARICKS Business Cards are designed to promote businesses (& business people) in a professional & engaging way & to always display the business logo whilst giving users quick & easy access to business contact information, website, location & much more. ASTARICKS Cards can include 10 pictures with hyperlinks. ASTARICKS Cards can also contain product images, sales promotions, coupons & much more. All ASTARICKS Cards have a unique ASTARICKS CODE and QR Code. 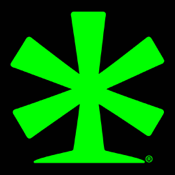 ASTARICKS Codes are not a graphic code, shape or image, they are number based codes that are very quick & easy to use. If you want to save an ASTARICKS Card you simply enter the ASTARICKS Code into the HOME keypad in the ASTARICKS Mobile app. It’s just like entering a phone number, in fact an ASTARICKS Code can include a phone number! Simply enter any ASTARICKS Code into the HOME Keypad in the ASTARICKS app & hey presto the ASTARICKS Card will appear at your fingertips. This app has a lot of high end features and can be downloaded for FREE. Here's a way to be as productive as possible when it comes to your business contacts and cards. 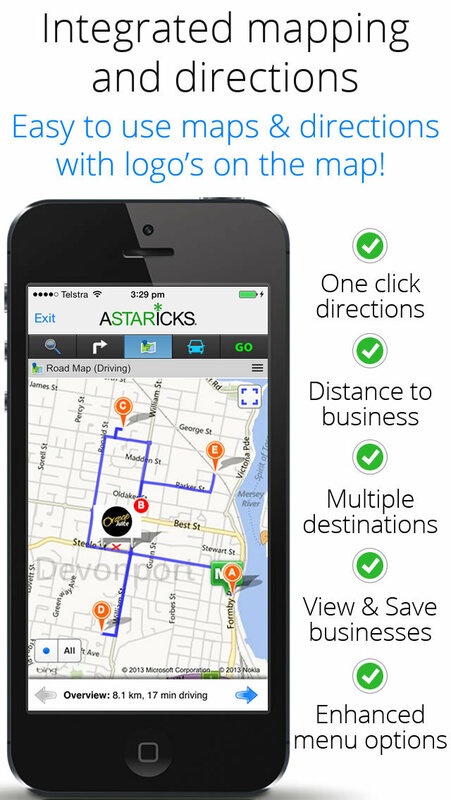 The ASTARICKS app can be used on your iPod touch, iPad, and iPhone as a way to save, view, sort, and even share ASTARICKS interactive business cards.